SEEKONE SK860 Pro OBDII EOBD code reader is an essential scan tool which allows DIY Mechanic or car owners to verify repairs, check State Emission Monitor Status and solve basic engine problems quickly and efficiently. -Yellow LED indicates there are some issues waiting to be fixed and clear codes. Read engine fault codes and shows definitions. Extra long 5.5 ft Cable. 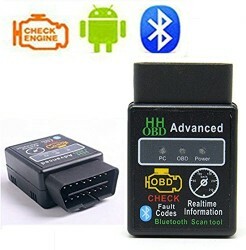 ★FULL OBDII FUNCTIONS–[New Version]A professional diagnostic scan tool for car owners.Supports Read and Erase DTC(emission-related trouble codes); Turn-off Check Engine Light, Reset Monitors; I/M Readiness Monitoring; Graphical and Numeric Live Data Stream; Built-in Over 3000 Generic Codes Definition Look up Library, etc. 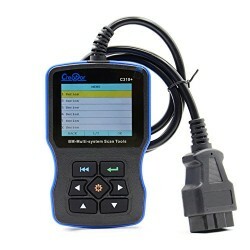 This obd2 Scanner Allows You Accurately Determine Causes of Engine Trouble. ★STRONG COMPATIBILITY –Works on most vehicles sold in the USA from the year of 1996; Supports all OBDII protocols: KWP2000, ISO9141, J1850 VPW, J1850 PWM and CAN. Works with English, German, French, Spanish, Italians, Dutch, Russian and Portuguese. 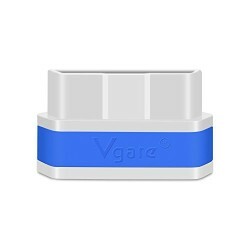 It gets the power directly from the OBDII Data Link Connector in your vehicle. 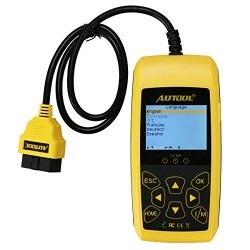 Fast scan and erase engine fault codes, let you decide if it’s something you can fix or need more advanced help. Save money and time. No need extra Battery! ★EXCLUSIVE OBDII DIAGNOSTICS — This automotive scanner with unique one-click I/M readiness status design, which fast to scan vehicle’s engine healthy status. Exclusive O2 Sensor Test, EVAP Test of Fuel Tank System(Mode 8) and Advanced On-board Monitoring(Mode 6) make you full control of vehicle running status. Red-Yellow-Green LED indicators allow you easily determine whether your vehicle meets the State Emission Monitor Status and assist you to pass the Smog Check. 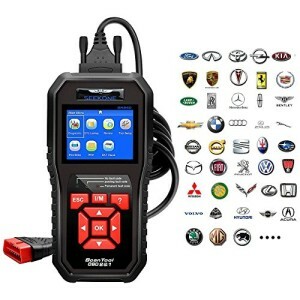 ★【RUGGED PATENTED DESIGN】Anti-shock and Slip Designed OBD2 Code Scanner for Cars, 15ft Height Drop-test Passed, Survive Longer in Complex Environment. 2.8″ TFT Big Size LCD Color Screen and More Comfortable Hand Feeling. Exclusive 5-ft Long Diagnostic Cable Allows You to Perform a Professional Diagnostics In or Out of Your Vehicles.